Summary: Natalie Sterling wants to be in control. She wants her friends to be loyal. She wants her classmates to elect her student council president. She wants to find the right guy, not the usual jerk her school has to offer. She wants a good reputation, because she believes that will lead to good things. My Thoughts: Wow, I really enjoyed this. The last few books I have read were just mediocre and am glad I read this to get me out of my reading slump. We are introduced to the three girls of the story. Natalie is a stubborn independent single girl. She is also a senior and runs for student counsel president. Then there is Autumn who is Natalie's best friend. They have been best friends for as long as they can remember. She is also a senior. She is kind of the quiet girl who got an unflattering nickname a few years back. We are than introduced to Spencer. She is a freshmen and the girl Natalie used to babysit. She also likes to have fun and stand out and soon is the attention of a lot of snarky rumors. We are than introduced to the guys. First there is Mike. He comes off as a jerk and likes to make fun of Natalie. He also runs against her for president. He is the kind of guy who always attracts girls even though he is a jerk. He thinks he's better and can get anyone he wants. Most of the time I wanted to slap him. Than there is his best friend Connor. Connor is quarterback of the football team and his family owns a Christmas tree, etc, business. He is popular and all the girls would love a chance at him. Even though he's Mike's best friend and popular, I always liked him. He was very likable from the get go. There was a lot of drama throughout this book and I enjoyed it a lot! I liked how Mike and Natalie were at each others throats. I liked how Natalie stood up for herself. She knew exactly what she wanted and even though she was shy at times she stuck up for herself. I also liked the interaction between the girls. They were fun to get to know. Now for the good part. Natalie starts to spend time with Connor. Natalie is supposed to be a good girl and she would never get mixed up with a popular boy, especially one all the girl's want to sleep with! I loved this. Connor is always doing sweet things. He donates wood for the bonfire, he helps Natalie off the ground during the rainstorm, he was an amazing guy. I loved all the sneak outs to the shed. I liked how she had to dress up as the school mascot and ended up talking to Connor. He was such a sweetheart and made my heart melt. Of course Natalie does not expect to like him as much as she does, I mean come on, he's Mike's best friend, how nice can he be right? There are lots of funny moments, romantic moments, kisses, and gossip throughout this novel. Overall: I highly recommend this book. I liked it a lot. It was fun to read. This was my first book by Siobhan but I know I'll read more soon. Natalie is the kind of girl to look up too, independent, smart, well preserved. And Connor, swoon swoon swoon! Cover: The cover is gorgeous! I love covers that show a girl/guy kissing or on the verge of kissing. I also like the stubble on his chin. Very cute cover! Everyone who reads this book seems to totally love it! I think that's an indication that I need to read it, too... I love the sound of the characters, and the plot sounds so sweet. Lovely review! 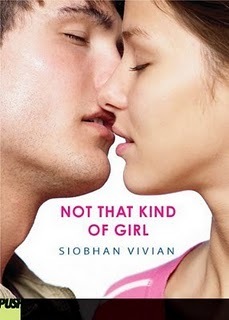 I loved Siobhan Vivian's A Little Friendly Advice, and I really want to read this! I just added this to my goodreads the other day. :) How funny!